Each year it is estimated that up to 250,000 people will walk around the Crater path. 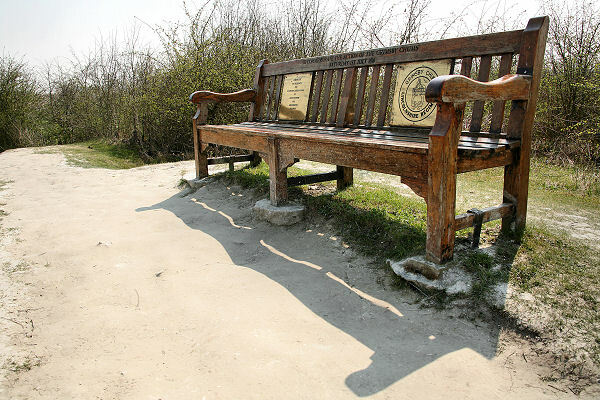 Whilst every visitor is welcome, the damage caused by wear and tear has been enormous. 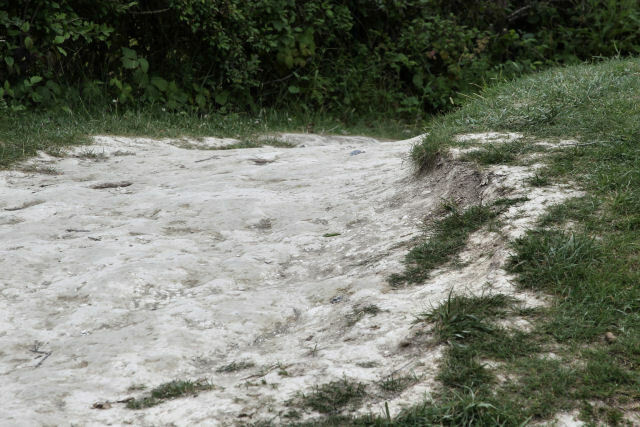 For instance, the chalk path itself has been eroded away at the rate of 6 inches in just 4 years. 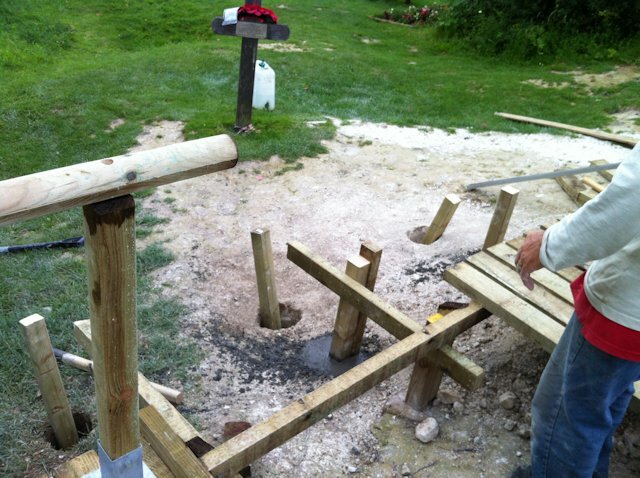 This also has made it increasingly dangerous, especially in the wet and whilst each visitor enters the site at their own risk, safety is always paramount. 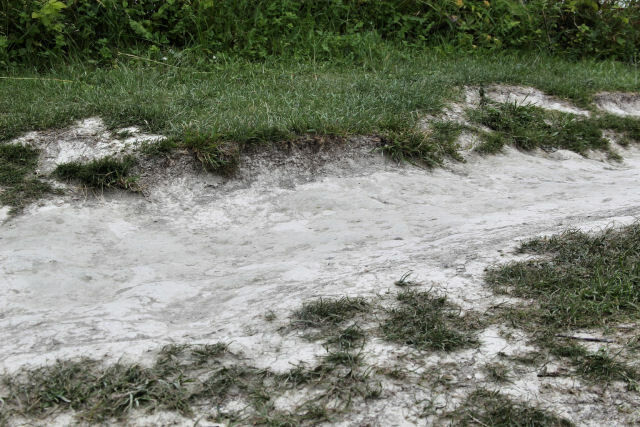 The path itself is ‘degraded’ chalk – debris from the original 1916 explosion and this reconstituted and compacted chalk will always turn to the ‘glue’ the moment it gets saturated and walked upon. 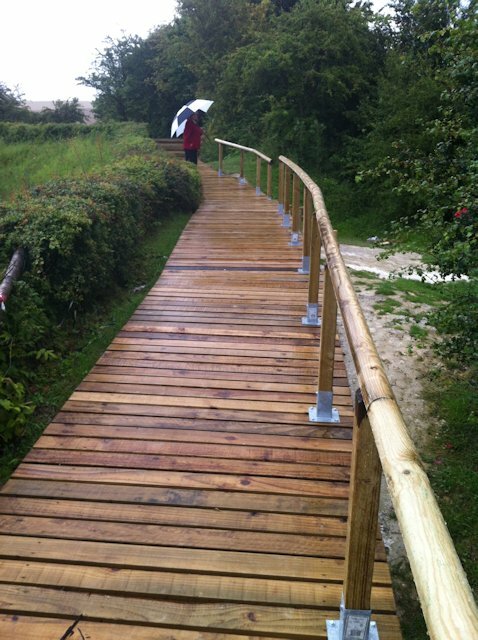 Therefore in the spring of 2012 a handsome wooden path was constructed to address these problems. In its 1922 book ‘Military Mining’ the Royal Engineers (RE) estimated the height of the rim of the Crater soon after the explosion at 15 feet (4.6 Metres). All the chalk that the rim is formed from and that people walk on today came from inside the Crater. Over the years the chalk has settled and compacted down. People, when visiting the Crater like to walk around the rim, and this has resulted in a very distinctly defined 300 yard (275 Metre) path. Aerial view, clearly showing the path around the Crater. 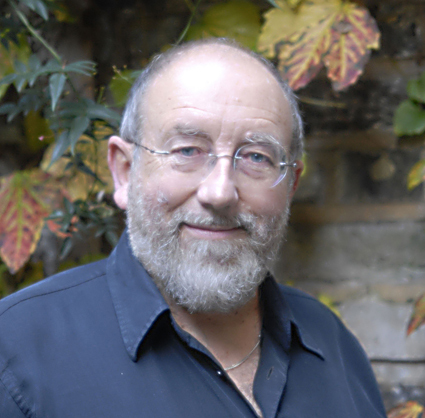 Image courtesy of Georges Vandenbulke © 2010. Until the early 1980s very few people went to the Crater, but since then the number of visitors has increased dramatically. 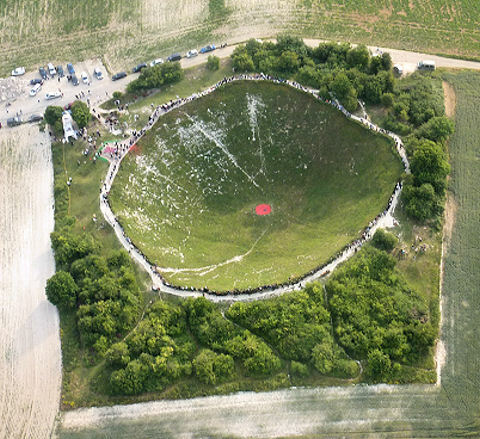 The 2010 estimate of visitors to the Crater was about 250,000. That so many people make the pilgrimage to this, now quiet and peaceful sanctuary that once saw so much suffering can only be regarded as a good thing. But (isn’t there always a ‘but’!) 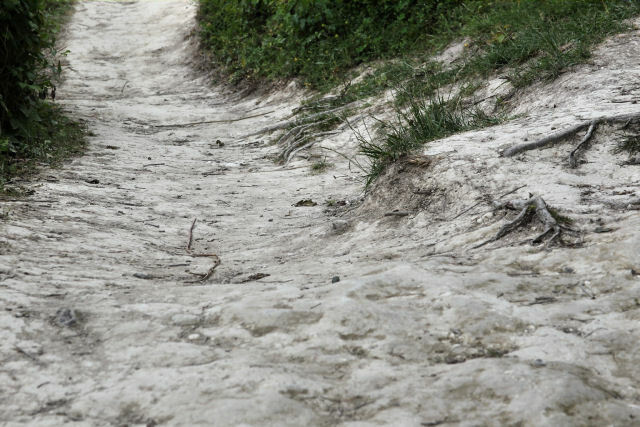 so many footfalls are causing severe erosion to the path that so many people are drawn to walk round. In order to keep the Crater in as original condition as possible something had to be done to reinforce the path and stop any further erosion. Having consulted professionals who specialise in sympathetically landscaping historical sites with plenty of footfall (i.e. Hadrian’s Wall), several plans were considered including ‘shuttering’ the path and filling it with small impact-absorbing stones but whilst this would have been suitable at other locations, it was considered unwise at Lochnagar given the growing number of schools who visit. All of us have on numerous occasions watched as unsupervised young people insist on throwing stones down into the Crater. Also, given the undulating nature of the path the frequent severe winter storms there might soon have washed small stones away. 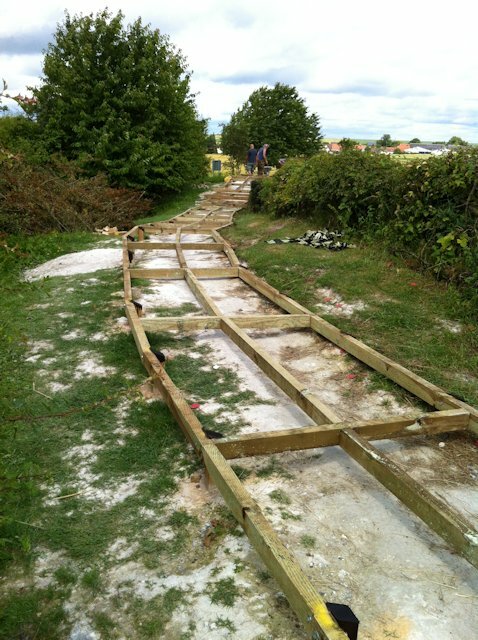 It is never a bad question to ask ‘What would the lads have done?’ and of course the answer would have been to lay duckboards – which is precisely what we have done. 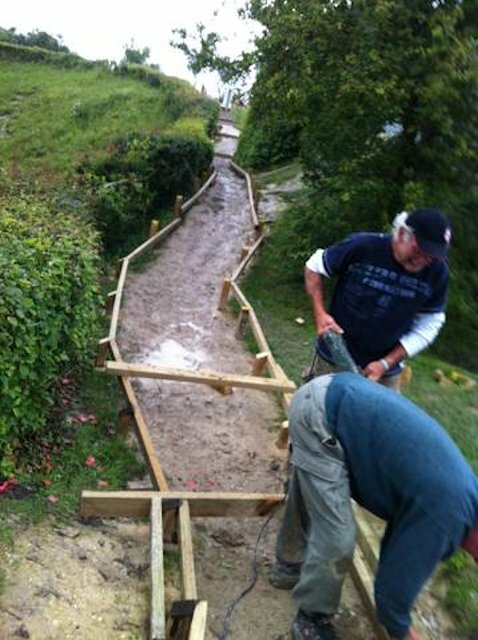 In early spring 2012, two skilled and dedicated Friends – Vinny Felstead and Brian Gibson, embarked on what was to be a formidable task – to lay and secure nearly 2,000 heavy slats of wood around the complete path and incorporating the existing wooden steps. 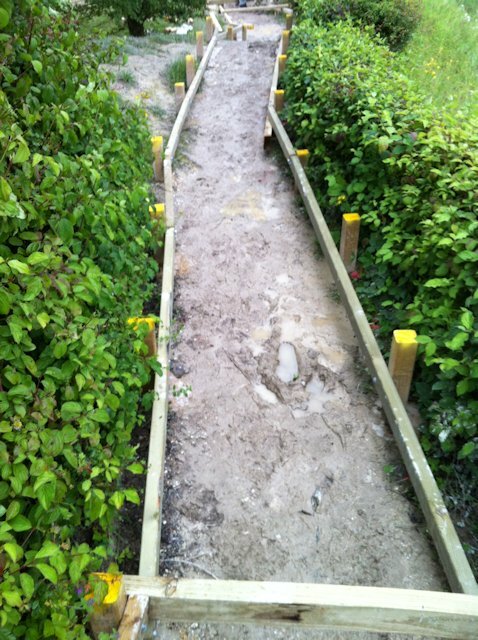 Two parallel wooden ‘rails’ had to be laid, which entailed digging several hundred foot-deep holes around the existing path to secure the posts to which the rails were screwed. Both Vinny and Brian worked valiantly for over ten weeks, carrying on through days of relentless rain and periods of searing heat. It truly became a remarkable labour of love and something for which we will all be forever grateful. But first, a word about the logistics of obtaining the wood and transporting it over. Much appreciation should be handed out to the timber company who, in 2010 supplied the wood for the new cross at such advantageous cost. 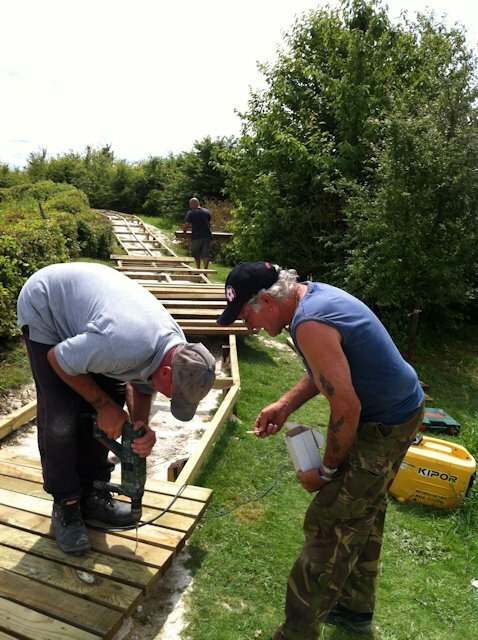 Step forward Job Earnshaw of Wakefield who, this year provided all the wood for the Memorial Path at a massive and most generous discount. Thank you gentlemen. It was duly transported over, all 12 tons of it, and taken up to the site on a daily basis. And of course, all the work had to be undertaken whilst several thousand visitors arrived and quite rightly, had planned a walk around the Crater. 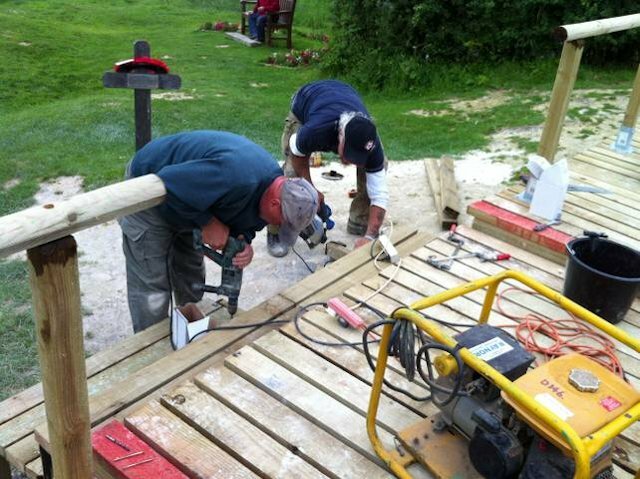 As can be imagined, there were many safety issues to be addressed but both Vinny and Brian maintained their usual helpfulness and politeness – despite the odd frustration of a handful of visitors who didn’t seem to grasp the concept of barrier tape! 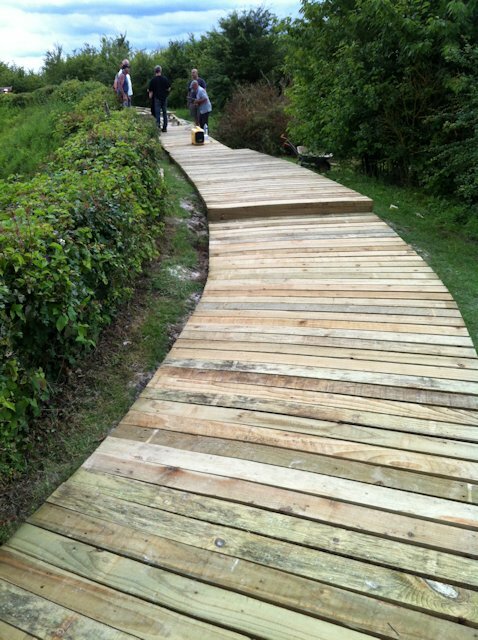 And now the path is finished and most handsome it looks too. The Royal Engineers of 1916 I’m sure would have been equally proud of it. The slats are 1.5m wide, strong enough to take the several millions feet that will grace it over the coming centenary years. 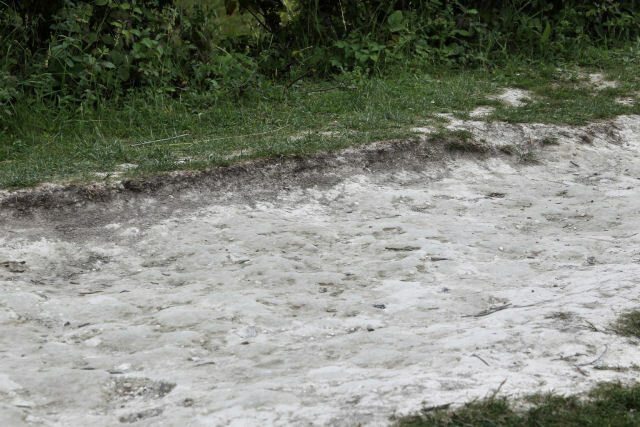 They will also protect and preserve the original chalk from the actual mine explosion, which is important. As we write this, another wonderfully supportive company J & A Stevenson of Telford who make a first-class anti-slip material called SureGrip, and have with incredible generosity donated the entire 2,000 strips needed to put on the slats. Again, thank you gentlemen.